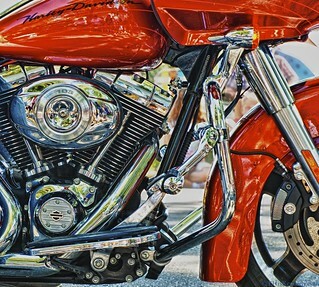 The front end of a Harley Davidson motorcycle, featuring the Mighty V-Twin engine. It sounded as pretty as it looks. Seen at the Fourth of July parade in Cedarburg, Wisconsin on July 4, 2011. Made with a Nikon D7000 and 24-70 lens.